Background/Purpose: Physical activity (PA) does not increase after total knee replacement (TKR) despite improvements in pain and function. A potential solution to this problem is to deliver a PA intervention during outpatient physical therapy (PT) that uses activity trackers, i.e., Fitbits and steps goals. We previously reported the 6-month preliminary effectiveness of our randomized controlled pilot trial. The aim of this abstract was to report on the long-term preliminary effectiveness and retention of PA at the 1-year follow-up. Methods: Patients undergoing outpatient PT after a unilateral TKR were randomized to a control or intervention group. Both groups received standard PT. The intervention group additionally received a Fitbit Zip, step goals during PT, and monthly phone calls after discharge (DC). A physical therapist created and progressed individualized weekly step goals from baseline to DC from PT. For 6 months (6m) after DC from PT, research assistants called participants once a month to progress the weekly step goal and encourage the participants to continue tracking their steps/day. After 6m, the PA intervention was discontinued and the Fitbit was returned. The primary outcome was PA, quantified as steps/day and minutes/week in MVPA measured with an ActigraphGT3X at DC, 6m, and 1-year. For this analysis, we compared PA between the control and intervention group at 1-year after PT discharge with a t-test. Results: Of the 43 people enrolled, to date 19 people have completed the 1-year follow-up (mean(SD) age = 67.0 (7.0) years, BMI = 31.5 (5.9) kg/m2, 53.4% women, days from TKR to PT = 13.8 (21.3)). At 1-year, those in the intervention (n=9) walked 5719 (1757) steps/day and spent 122.3 (101.9) min/week in MVPA, whereas the control (n=10) group walked 3959 (2009) steps/day and spent 46.7 (73.4) min/week in MVPA (Figure 1). 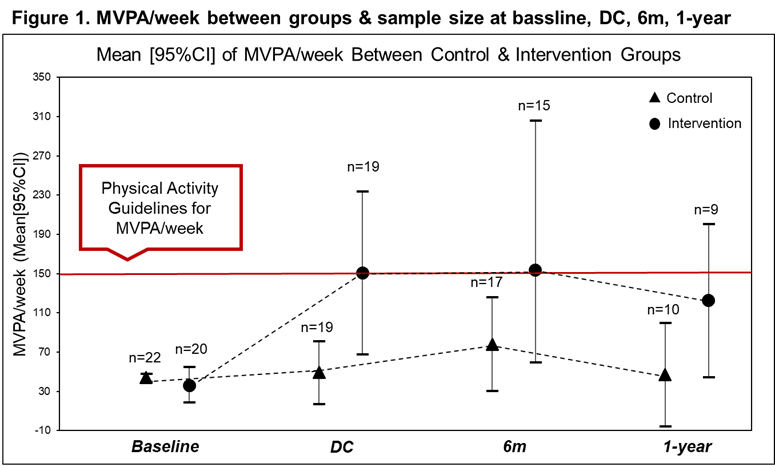 The intervention group accumulated 1,760 more steps/day (p=0.13) and spent 75.6 (p=0.24) more minutes/week in MVPA at 1-year than the control group. Conclusion: The preliminary results indicate a physical therapist-administered PA intervention may increase PA after TKR. 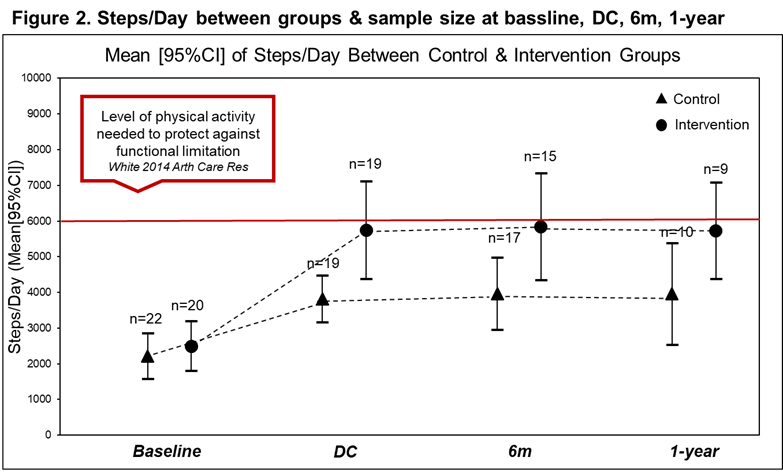 At 1-year, the intervention approached clinically meaningful levels of PA for steps/day, i.e. walking close to 6,000 step/day which is a benchmark known to protect against the development of functional limitation, and spent close to 150 min/week in MVPA, which is recommended dose from the 2008 Physical Activity Guidelines for Americans. Disclosure: M. Christiansen, None; L. Thoma, None; H. Master, None; D. Mathews, None; L. Schmitt, None; M. Ziegler, None; D. White, None. Christiansen M, Thoma L, Master H, Mathews D, Schmitt L, Ziegler M, White D. 1-Year Outcomes from a Novel Physical Therapist-Administered Physical Activity Intervention after Total Knee Replacement: A Pilot Study [abstract]. Arthritis Rheumatol. 2018; 70 (suppl 10). 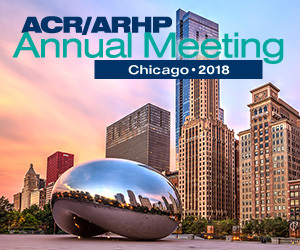 https://acrabstracts.org/abstract/1-year-outcomes-from-a-novel-physical-therapist-administered-physical-activity-intervention-after-total-knee-replacement-a-pilot-study/. Accessed April 22, 2019.